Born Free is saddened to learn of the killing of a female tiger at London Zoo, following introduction to a new male at the zoo. “This unfortunate event starkly exposes the restrictions of life in captivity. Unlike their counterparts in the wild, animals in zoos are denied the opportunity to choose their own mates, and trapped in enclosures without escape, aggression can quickly result in tragedy,” said Born Free’s Head of Animal Welfare and Captivity, Dr Chris Draper. Tigers face many threats across their range in the wild, particularly from habitat loss and poaching, but Born Free is convinced that the key to their continued existence rests on finding solutions in their natural habitat, instead of in captivity. 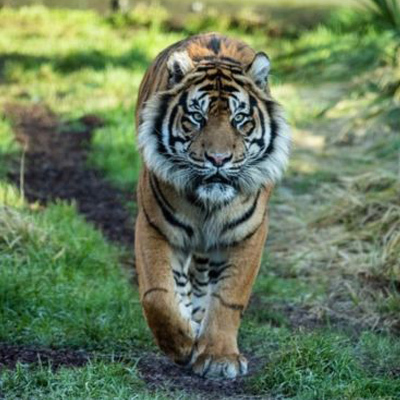 London Zoo’s ‘Tiger Territory’ enclosures were built at a cost of £3.6m and housed two Sumatran tigers in less than one acre. By contrast, there are thought to be at least 400 Sumatran tigers remaining in Indonesia. Born Free is committed to genuine tiger conservation through its Living with Tigers programme, which is working to safeguard the future of 500 wild tigers across the Satpuda Landscape of central India.